The Red Tower is a Grade 1 listed building, and dates back to 1490. It is the only brick built tower on the medieval city walls. 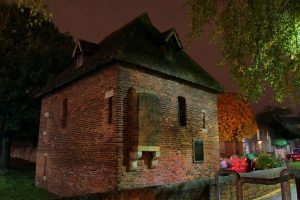 Originally built as a watchtower, it was part of a larger programme of improvements to the city’s defences ordered by Richard III and completed by his successor, Henry VII after Richard’s death at the Battle of Bosworth. 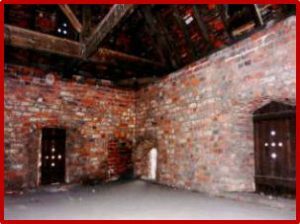 The tower has been repaired on many occasions and having sat locked up and empty for years, it is now at the heart of a community initiative to create a magical space for residents and visitors to enjoy. Why Is the Tower Here? In 1068, William the Conqueror dammed the river Foss at Fishergate, raising the water level by 2m (6ft) and flooding the moat of his new castle. This also created a large lake, known as the ‘King’s Fishpond’. This later map of 1610 by John Speed shows how the water provided a very effective defence, as it spread over low ground to the east of the city and also some distance up Tang Hall Beck. No defences were built around the south east of the city for another 100 years. Speed’s map is the first proper survey of York. It shows the medieval city walls surrounding Walmgate from Fishergate Tower to Red Tower, each sited next to the waters of the flooded river Foss. The first reference to defences onthe east side of the river Foss is to Walmgate Bar in 1155. This is probably when the first earth rampart and timber palisade defences were built around this part of the city. It is also likely there was a timber ‘tower’ where the rampart and palisade ran into the water of the Kings Fishpond. A deep ditch was dug in front of the rampart, along the modern route of Foss Islands Road and Paragon Street, and discharging into the Foss at Fishergate. There are records of the city corporation granting fishing rights, so the channel must have been a significant width and depth. Part of this ditch still existed when Foss Islands Road was built in the 1860s, as shown on this Ordnance Survey map of York of 1852. The masonry walls were built in the 14th century. A contract of 1345 still exists in the City Archives for replacement of the timber palisade at Fishergate with the masonry walls we see today. Master Mason Thomas de Staunton was paid £7 per perch to build a wall 6 ells (22.5ft) high, and 7-8ft thick. The contract included an option for building more walls in Walmgate on the same terms, which is probably when the walls from Walmgate to Red Tower were built. It is also possible that these walls ended with a masonry ‘Tower’ on the site of our Red Tower, and perhaps a small building similar to the corner tower in Fishergate (next to the pedestrian crossing). Before his defeat in 1485, Richard III agreed spending with the city corporation to repair and improve the walls. Negotiations continued with his successor, Henry VII, who visited York a number of times to impose his authority and ensure the loyalty of the city. The Mayor, William Todd paid for 60yds of wall repairs near Fishergate Bar in 1485 (see the plaque this on the Bar) and was knighted by Henry VII in 1487, after the city repelled a rebel attack on Bootham Bar. Unrest continued, and in 1489 a further rebellion severely damaged both Walmgate and Fishergate Bars, after which Fishergate was walled up. In 1491, the king was still ordering repairs and improvements to the city walls, bars and defensive ditches, and for guns and powder to be obtained. Similar instructions were issued by the Mayor to every Ward in the city in 1493. 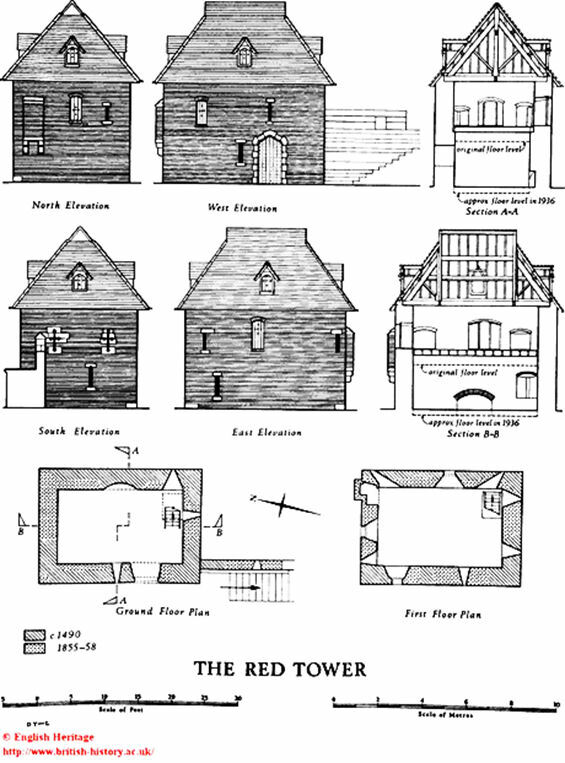 These works must have included Red Tower, as it was under construction in 1490. Fishergate Postern Tower was started in 1503. Red Tower is the only brick tower in the city, hence its name. The lower levels of the Tower appear to be masonry, so either the brickwork was built on an earlier masonry structure, or stone was used for the part which was under the waters of the King’s Fishpond. The top of the Tower was originally similar to Monk Bar, with a flat lead roof and battlements, as did Fishergate Postern Tower. The Tower was first mentioned by name in 1511, when artillery was assigned to it. After repair in 1541 and 1545, it was regularly leased. Infilling the Kings Fishpond and building Foss Islands Road in the 19th century has raised the ground level, burying the original ground floor and making the Tower look surprisingly short. The present building, including its dramatic-looking roof, is largely the result of Victorian restoration, but it incorporates some materials and features from the original tower, including the shape of the windows. The long and thin external brickwork was re-used by the Victorian rebuilders, and some can be seen inside too. 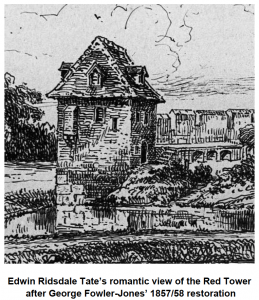 The City Corporation decided they couldn’t afford to build Red Tower in stone and asked the Tilers’ Guild to build the tower. 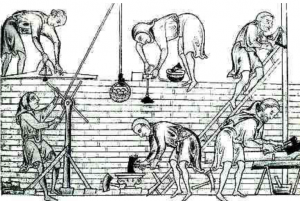 The Masons’ Guild controlled all stone work in York, and were angry that the tower was to be built by tilers (tilers were also bricklayers). This sparked a vicious feud and the tilers soon complained that their tools were being broken or stolen and asked for protection from the Corporation. In 1491, a tiler (bricklayer), John Patrick, was murdered. Two masons were charged with his murder. One was a leading official of the Masons’ Guild, William Hindley (he was the Master Mason at the Minster, responsible for the great screen of statues of the kings of England). The other was Christopher Horner. It is said that he could not be arrested by the city authorities because he stayed in the Minster area, which was controlled by the archbishop. Hindley seemed totally unashamed, and it is reported that he employed a man to shout news of his imprisonment through the streets of York, so that all who had business with him should know where to find him. Neither man was convicted of the murder, probably reflecting the high status and influence of masons in the city, compared with tilers. The tilers finished the Red Tower but no other brick towers were built. The bricks were probably made in the long established brick works that existed in the area until the 20th century and can be seen on the 1852 map, now the James Street area. During the Siege of York in 1644, Red Tower, Walmgate Bar and adjoining walls, suffered major damage when canon on Lamel Hill and in St Lawrence’s churchyard bombarded the area. Although it was June/July and flows in the Foss were likely to be minimal, the marshy ground and King’s Fishpond must have presented a significant obstacle, preventing the Parliamentary army from entering the city. In the latter stages of the siege, preparations were made to cross the river Foss near Layerthorpe. This would suggest that Red Tower and the adjacent walls were well defended by the Royalists. After the siege, some initial repairs to the walls were started in February 1645, including enlarging the ditch in front of Red Tower. 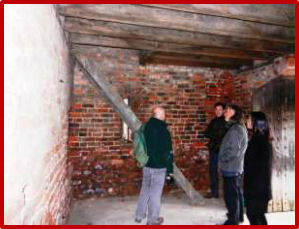 Work also commenced on Walmgate Bar in October of that year, financed by fines on the Royalists. Walmgate and Red Tower in 1673. A book by Henry Keep of 1680 describes the city as being ‘encompassed with strong, lofty, magnificent and new walls which add much to the grace and beauty as well as to the strength and security of this city’. 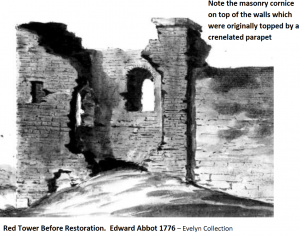 However, a drawing of 1776 by Edward Abbot shows the Red Tower in a very decayed condition, with one wall missing and no roof, so although walls and other Bars had been repaired, perhaps Henry Keep hadn’t seen Red Tower, or was just speaking wistfully. 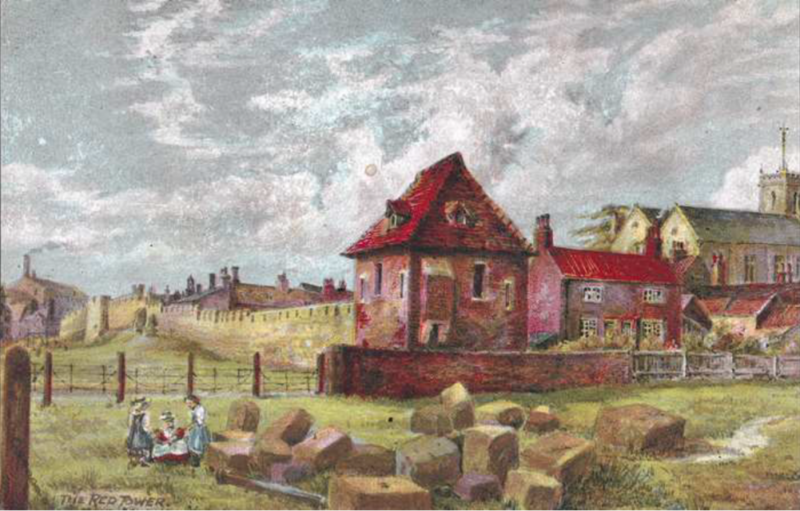 Some repairs had been undertaken to Red Tower by 1800, when it is known to have been rented as a stable, and a drawing dated 1825 by George Nicholson shows it with a pitched tile roof, but also one lower corner wall missing. Around this time it was known as ‘Brimstone Tower’ possibly derived from its use as a store or manufactory of gunpowder. 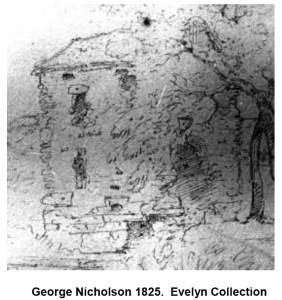 William Pumphrey, the pioneering York photographer, shows Red Tower in 1853 with the same roof as George Nicholson. By this time the walls have been crudely repaired to safeguard the building. York Corporation took over the Foss Navigation in 1854 and the Kings Fish Pond was filled in, raising ground levels in the area around the tower. York Archaeological and Architectural Association (YAYAS) raised £800 in 1855, to help pay for Foss Islands Road to be built on the present alignment, avoiding any damage to Red Tower, Walmgate Bar and the walls in between. As part of these developments, the architect George Fowler-Jones undertook a major reconstruction of the Tower in 1857-58. This is how we see it today, with dormer windows in the hipped tile roof, a replica garderobe and ‘arrow-slit’ windows. Floor levels have been raised to correspond with higher ground outside and do not correspond properly with the windows. The first floor is reached by a ladder. The external bricks are mainly the Tudor originals, but inside, Fowler- Jones has used Victorian bricks. The door is also likely to be from the Fowler-Jones restoration, but the concrete ground floor and first floor timbers probably date from works in 1958. Tate painted this view for a postcard series in 1906, but showing the scene as he imagined it in approx. 1860, shortly after reconstruction of the Tower and the King’s Fishpond had been filled-in. The picture shows the ramparts and walls rising as they run away from the area of the former King’s Fishpond, which was adjacent to the Tower. The large masonry blocks in the foreground have probably come from the recently demolished prison (now castle carpark) and these stones can be seen forming the wall around the Tower’s garden. Behind the Tower are a pair of cottages and further over to the right is St Margaret’s Church (now the Early Music Centre). On the far left of the picture is the flax mill with smoke rising from its chimney. The Red Tower is of considerable interest and charm, particularly the 1st floor, where light filters through the arrow slits shutters and dormers. The setting is attractive too, with the door facing away from the busy road and surrounded by a nice wall and garden. Adjacent steps to the wall-walk bringing frequent visitors. 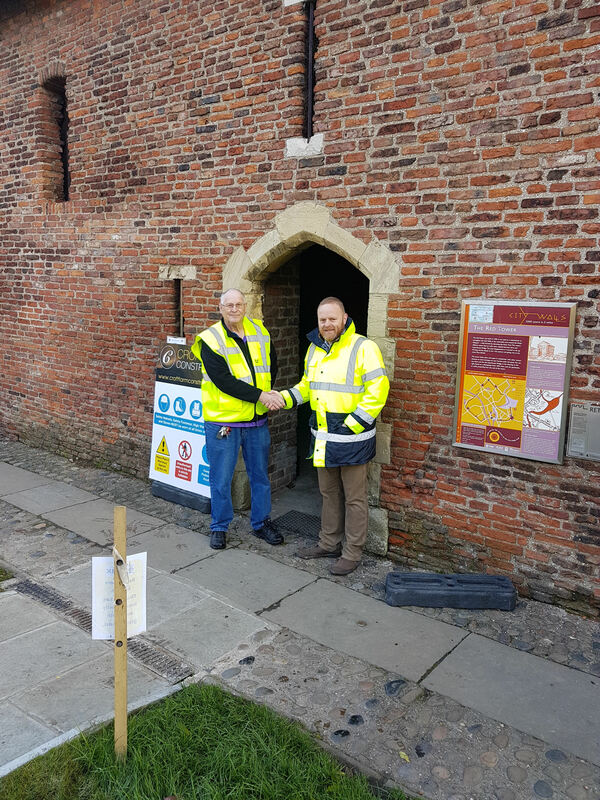 In early January 2015, the Tower was taken over from the Friends of York Walls by a group of dedicated volunteers and became known as the Red Tower Project, with a vision to bring it back into public use for the benefit of the local and wider community. Each Saturday during the year the team operated a ‘pop up café’. Undeterred by the floods of Christmas 2015, the team pursued its vision, and in February 2017 secured a thirty-year lease from the City of York council, and later gained planning approval for the internal upgrade of the building which will create a ground floor café area and a fully equipped first floor meeting space. On 6 November, 2017 a significant event in the past, present and future of the Red Tower occurred. After two years of planning, the mission of the Red Tower team took a major step closer to realising our dream. 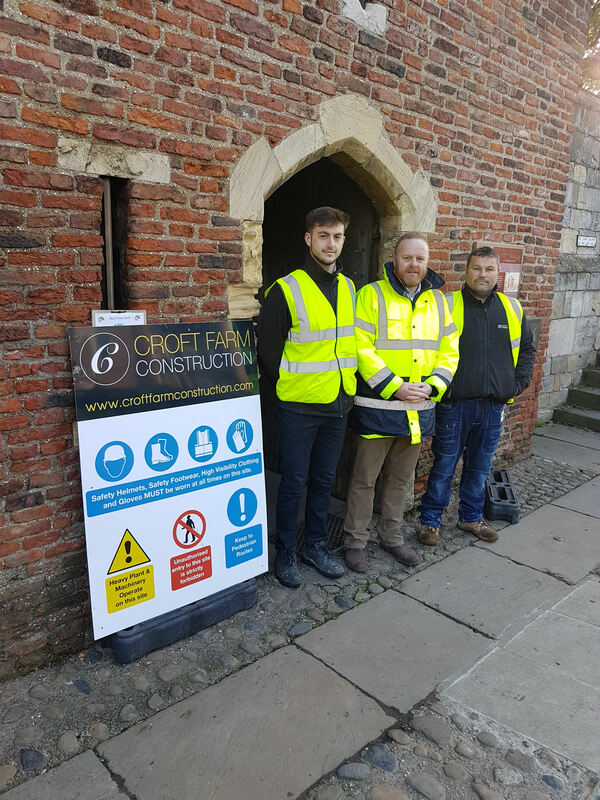 The Tower was officially handed over to Phil Gledhall – Managing Director of Croft Farm Construction and his management team of James Hampshire – Project Manager and Gareth Wilson – Site Manager. See photo of the team, and myself handing the Tower over to Phil Gledall. The Croft Farm company won the contract to carry out the internal upgrade to our iconic, historical building, which when complete will contain a kitchenette, toilet cubicle, a new glass encased staircase, and a fully functional 1st floor meeting space, All the work is to be carried out the the highest possible standard and compliant with all flood resilience requirements. Completion is anticipated to be late January – early February. Compiled by Christopher Rainger, for the Friends of York Walls. January 2014 – Revised Jan 2017 and the latest revision by Barry Beckwith for Red Tower CIC – December 2017. Thanks to the following for information and images: Victoria County History, The Royal Commission on Historical Monuments, Simon Mattam of the Friends of York Walls, York Archaeological and York Architectural Association, York Art Gallery, York City Archives, The Evelyn Collection and Imagine York. 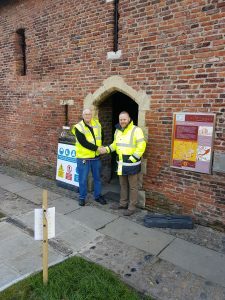 Very special thanks to John Oxley, City Archaeologist, for his generous encouragement and facilitating the public opening of Red Tower by the Friends of York Walls.